HAVANA (Reuters) - Cuban President Miguel Diaz-Canel accused the Trump administration on Saturday of dragging relations with the United States to their worst level in decades and called on Cubans to strengthen the Communist-run country's defenses and economy. Diaz-Canel, in a speech closing the National Assembly, said the United States is engaging in an "asphyxiating financial persecution that makes the import of goods and resources of primary necessity particularly difficult." Cuba's Economy Minister Alejandro Gil Fernandez earlier in the day called on the government to tighten belts further and seek alternatives to imports, as foreign exchange earnings decline and credit for supplies and investment become more difficult to find. "Exports are not growing as planned. The levels of foreign investment that the economy demands are not materializing," Gil said. "We can forecast the import plan will not be fulfilled because the credits we need cannot be finalized due to the arrears of payments of debts." 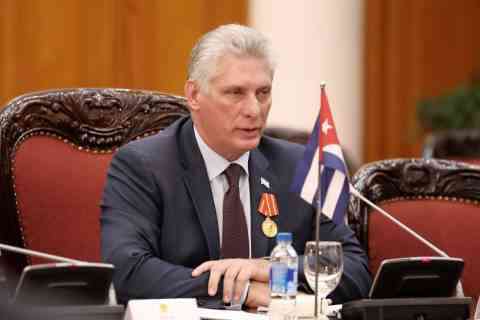 "Our response is no, imperialist gentlemen, we Cubans do not surrender," Diaz-Canel said on Saturday, adding the situation meant "we have two absolute priorities: the preparation of our defense and the economic battle at the same time."